Apples make for a great snack. 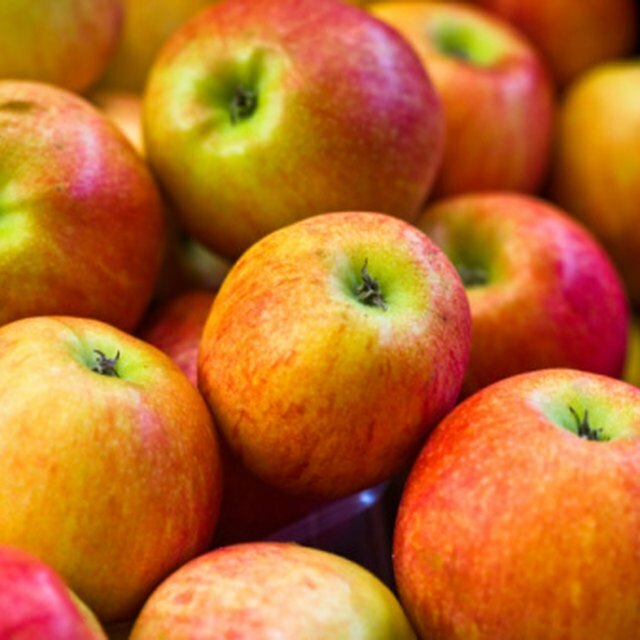 3 What Is the Nutritional Value of an Apple? A Jazz apple is a variety of apple from New Zealand that's a cross between a Braeburn and a Royal Gala. It's sweet and crunchy with a dense flesh. Most of the calories in a Jazz apple come from sugar, as with most apples. According to LIVESTRONG's food database MyPlate, a medium Jazz apple contains 80 calories, which is four percent of the daily value for calories based on a standard diet of 2,000 calories per day. Each ounce of Jazz apple is approximately 15 calories, so take this into account depending on the size of your apple. A smaller apple will have fewer than 80 calories, and less of the carbohydrates, fat, protein, fiber and sugar listed below as well — just as an apple over five ounces will have more of these components. The calorie content in a Jazz apple comes almost entirely from carbohydrates, as a Jazz apple contains no fat or protein. The carbohydrate content in a Jazz apple is 22 grams, or about 7 percent of the daily value for carbohydrates. A medium Jazz apple also contains five grams of dietary fiber. According to HelpGuide.org, there are many benefits of eating natural fruit fiber, including encouraging healthy digestion, improving cholesterol levels and lowering the risk of type 2 diabetes. For those trying to lose weight, fiber regulates blood sugar levels and maintain's the body's capacity to burn fat; it moves fat through your body quickly so less can be absorbed; and it provides energy for exercise. A Jazz apple contains 16 grams of sugar, or about 64 calories which equates to 72.7 percent of its total calories. According to Organics.org, there is a big difference between the way the body processes natural sugars in fruits as opposed to processed sugars. The fructose in an apple enters the body along with the other nutrients the apple contains, which slows down the body's absorption of the fructose, not allowing it to spike blood sugar levels the way processed sugars can. How Many Calories Are in a Rocky Mountain Caramel Apple?